Taste test: These are different from most kettle chips, kind of lighter than Cape Cod chips. They have just a subtle honey mustard flavor. Not a bad chip. 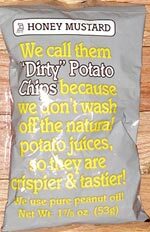 Smell test: Smell like kettle chips. This snack was discovered by Keith at West Side Market & Deli, Washington D.C. (near Georgetown).